I would like to share briefly my expereince using NanoCap, an open source software tool, to generate capped (closed-ended) carbon nanotubes (CNTs) that I am currently using in my research work. Generating open-ended CNTs is quite easier than capped ones as the former has a generic equation to generate the XYZ coordinates. For example, we have tools in mdFoam to create CNTs but there exists no functionality in mdFoam to generate the capped CNTs, except by trying to combine them with open bucky-balls. So I have implemented a functionality in mdFoam that can now read-in the capped CNTs that are generated first using NanoCap. In addition to capped/uncapped CNTs, NanoCap can also generate various fullerene configurations. NanoCap can be downloaded from http://nanocap.sourceforge.net. I have used the Python interface to NanoCap to create capped CNTs of different radii as shown in the below figure. 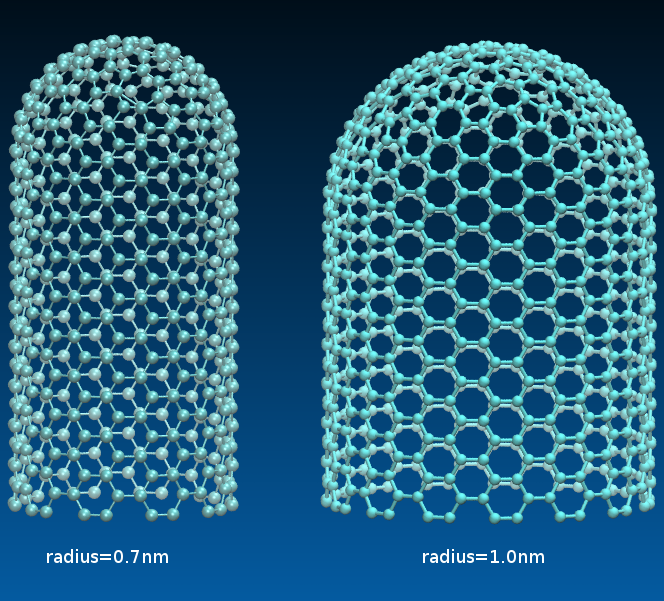 NanoCap can easily create capped CNTs upto 2nm radius.